To the uninitiated, the title of this disc might portend bad omens. 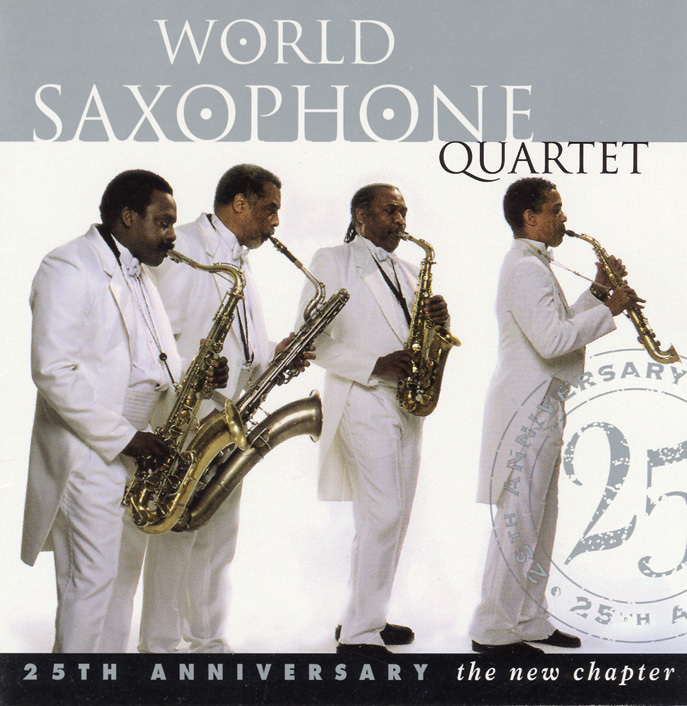 These four guys have been playing saxophone together for twenty-five years—how can they possibly still be interesting? Of course, that question is answered most affirmatively after a few minutes of listening, but it still deserves comment. With a combined eight decades of shared experience, the members of the WSQ have an amazing degree of cohesion. They constantly teeter on the balance between arranged parts and full-on improvisation, knowing intuitively when to hold back and when to unleash their collective energy. 25th Anniversary also marks a return to fundamentals for the WSQ, after numerous tributes and collaborations. Precisely four musicians play on this disc, and they perform only original compositions (David Murray's arrangement of the traditional "Goin' Home" is the sole exception). In this setting, individual musical personalities shine through more clearly than ever. The opening track, Murray's "Suki Suki Now," offers an upbeat bluesy theme with loosely interwoven harmonies—and plenty of space to stretch out. Contrast this version with the one found on Murray's recent Power Quartet recording (Like a Kiss That Never Ends) and the WSQ approach seems much more angular yet grounded. Even during formally coordinated parts, the quartet paints with broad strokes, blurring lines and shifting about to defy expectations. Bluiett's brief "Bits 'n' Pieces" presents darker hues, with greater harmonic and tonal complexity. The improvisation here is open-ended and moody. And with John Purcell's "The New Chapter," the quartet explores sonorities made possible through overdubbing. The WSQ's first experiment of this kind, Purcell's tune explores denser harmonies and allows players the opportunity to improvise over arranged segments. It's not a total success, but the novel approach holds potential for expanding the quartet's palette. This disc offers special rewards to listeners interested in the possibilities available through pure saxophone sound. With the amazing tonal and timbral range available to these four players, 25th Anniversary presents proof that maturity can indeed be a valuable asset.